Seeing is Believing This sample manual to teach Supervisors and Managers is in MS Word format. It is essential for your organization to establish a training plan in order for your employees to meet the challenges of the current marketplace. Personnel in supervisorial or management positions require specialized knowledge for maintaining a productive work environment. The courses we have included in our Supervisors and Managers Bundle will inspire innovation and motivation in your students, which in turn will transform into organizational success. Training in your organization can have a real effect on business outcomes. With our Supervisors and Managers Bundle, we have included twenty courses written specifically for developing the skills of your business leaders. 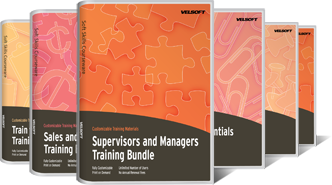 Our Customizable Training Materials for Supervisors and Managers cover all aspects of organizational leadership. Learners will be introduced to essential concepts and strategies for improving communications, evaluating and changing procedures, motivating others, and developing goals. Educating your professional students with the courses included in this Bundle is a wise investment. They will become an integral part of maintaining your organization’s competitive advantage.